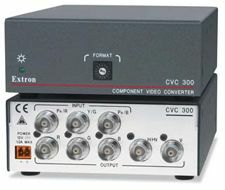 Extron Electronics’ CVC 300 is a new universal, high definition component video to RGB converter. It accepts all standard definition and high definition analog component video formats, from 480i and 576i to HDTV 1080p/60 and 1920x1200, and transcodes the incoming component video signal for output as RGBHV or RGBS. The CVC 300 is ideal for use in applications that require the integration of devices with component video output into RGB-based AV system designs. The CVC 300 supports interlaced or progressive scan video with bi-level or tri-level sync. Bosch Communications Systems’ IRISNet V2.0 continues to expand IRISNet’s array of features by adding new devices such as EV REV wireless microphones. IRIS-Net V2.0 also brings FIR-Drive technology front and center. FIR-Drive combines transducer development, FIR processing, and DSP protection algorithms to create a holistic approach to system development. IRISNet V2.0 provides additional FIR-Drive controllers, a new Peak Anticipation limiter, and new speaker settings for EV concert sound products. QSC’s CSM Series stage monitors series comprises three models: the CSM10, CSM12, and CSM15, respectively equipped with 10-, 12-, and 15- inch woofers. At the high-end within each of the horn-loaded, two-way cabinets, compression drivers outfitted with neodymium magnet structures, 3-inch voice coils, and 1.4-inch exits can be found. High power output, clean, transparent sound, and rugged reliability are central to CSM Series performance. Premier Mounts has introduced a new projector mount for its GearBox line of security mount products. Designed to better suit safety, security, and function needs in the education, retail, and hospitality industries, the new projector mount features more projector mounting hole patterns. The GB-SEC1’s design does not require extra drilling or modifications to install. Additionally, the projector mount offers lateral shift and a recessed-barrel lock. Crestron’s DigitalMedia (DM) system consists of matrix switchers, repeaters, and receivers. Flexible and modular, DM matrix switchers accept every type of signal and transmit them long distance as digital DM signals. Built-in QuickSwitch HD technology pre-authorizes HDCP keys and maintains a constant handshake for fast, uninterrupted HD switching. At the end points, DM receivers output HDMI and control to the display. There are input cards for every signal type, including the HDMI card with DSP. The UPS from Middle Atlantic Products features Pure Sine Wave technology, integration with AV control systems, and a sliding rear rackrail mount that provides a single-person UPS mounting capability. In the event of a power outage or extreme over/under voltage occurrence, the system’s AVR capability ensures a continuous 120V output and the Pure Sine Wave technology minimizes harmonic distortion and line noise. The four-millisecond transfer time ensures that connected equipment stays online with no lock-ups. Sony Electronics’ 1080i HD videoconferencing technology, the PCS-XG80 system will feature enhanced functions and capabilities with the release of version 2.03. New features include compatibility with the MPEG-4- AAC-LD and MPEG4-AAC-LC audio formats and HD video transmission capabilities at narrow bandwidths and in unstable public IP network or ISDN environments. Version 2.03 enables support for existing and emerging videoconferencing applications including immersive, room and personal HD 3D telepresence, and broad-scale desktop video collaboration, as well as traditional videoconferencing. Epson has introduced four new projectors optimized for the classroom with new features that make them easy to use, inexpensive to operate, and effective for both teachers and students. The PowerLite 84, 85, 825, and 826W offer extended lamp life up to 6,000 hours, a built-in closed captioning decoder, USB Plug ‘n Play technology, a powerful internal 10-watt speaker, network connectivity for remote presentations (via wired LAN), and optional wireless connectivity. Revolabs’ Executive HD system provides the sound fidelity of wired microphones with the added appeal of a versatile wireless set-up. High definition audio clarity and full 50Hz-22kHz frequency response, enabled by Revolabs DFS22TM proprietary audio processing, are the key factors behind the improved audio performance. With an optimized speech codec, the new Revolabs system handles live sound, voice reinforcement, recording, and wideband video- or audioconferencing applications. Revolabs’ DFS22, ‘Designed For Speech’, technology improves the intelligibility and presence when reproducing the spoken word. RGB Spectrum’s Linx family of routing switchers expands with the breakthrough new Linx 3300 Cross Format switcher. Offering a switching solution for environments with both DVI and analog RGB sources, the model 3300 supports both signals on every input channel. Analog RGB is internally converted, processed through the switcher and output as DVI. Perfect for the facility that is transitioning from analog to DVI, or requires continuing use of specialized equipment with analog RGB output, the Linx 3300 accommodates any mix of the two formats. Mitsubishi Digital Electronics’ XD221U classroom projector offers a combination of AV features that makes teaching more effective with technology that is easy to use. The XD221U has two separate 3.5mm audio inputs and a built-in audio mixer so the projector can simultaneously project audio from two sources, such as a DVD and a third-party wireless microphone. The XD221U’s Audio Mix feature allows users to adjust the volume levels of each input for its 10W built-in speaker. Digital Projection International offers an advanced Warp and Blend system to complement its range of displays. Through a partnership with RockWell Collins, the Mercator III offers precise, low latency image warp and blend technology. Offered for the first time on DPI’s commercial AV pricing update, the Mercator III is a modular, rack mounted solution that can be ordered in standard configurations to support from 2 to 16 display channels. The Sabine Phantom gooseneck and podium mics are designed to literally see you coming and going. They are ideal for everyday users who are not trained professionals in terms of miking techniques. Sometimes these users stand too close or too far away, and there are times when no one is working the mixing board to correct for these problems. That’s why the Phantom mics feature a built-in IR sensor that automatically turns the mic on when someone approaches it and mutes it when they walk away. No more missed cues or unattended mics. Dynamic Systems has released a low cost tool manager program based on bar code technology. DSI’s “Basic Tool Manager” is targeted for contractors who want to reduce the loss of tools and save time tracking down tools for the jobs but cannot afford the more complex systems available on the market today. In an example of co-engineering between Crown and JBL that ultimately benefits the entire worldwide VerTec system owners’ community, JBL Professional’s V4 DSP presets are now available for Crown’s I-Tech HD series amplifiers. JBL’s new V4 DSP presets for Crown I-Tech HD amplifiers are available for immediate download from www.jblpro.com/products/tour/Vertec/V4download.html, and also come bundled with the just-released version 1.90.1 of Harman HiQnet System Architect Software. Extron Electronics’ FOX 4G DA8, an eight-output fiber optic distribution amplifier and the FOX 4G SW8, an eight input fiber optic switcher, are now available. Both products are designed for switching and distribution, as well as long haul transmission of fiber optic AV and RS-232 control signals over a single fiber. Engineered for reliability and exceptional performance, they support up to 4.25 Gbps digital switching and distribution for standard definition video, high resolution computer-video, DVI-D, and multi-rate SDI. Black Box has released a new family of browser-based, networked digital signage media players and appliances designed to simplify the layout and distribution of professional-caliber content. Designed for standalone or multisite applications, Black Box’s iCOMPEL appliances make it easy to assemble and manage HD-quality digital signage content. The iCOMPEL system can be used for content management, scheduling, and distribution, plus system monitoring. It supports playing of stored and live media in multiple screen zones, as well as changing content ad-hoc at the display. SunBriteTV’s 3220HD-TS is a 32-inch all-weather touchscreen display designed for outdoor commercial installations where interactivity can be used. The 32-inch LCD HD screen on the 3220HD-TS displays a bright 1366 x 768 pixel image with 1500:1 contrast ratio. Built into the exterior, in front of the LCD screen, is the all-weather interactive touchscreen that is available using either Surface Acoustic Wave technology or Dispersive Signal technology. Bretford is adding six new 4:3 and 16:9 format Video View wall mounted projection screens. The new screens are part of Bretford’s Basics brand technology furniture family. The new 4:3 TV-Shape Video View models are calibrated to the standard TV size so viewers see an image that looks correct, whether they’re in a classroom or a conference room. They are available in diagonal sizes of 102 inches, 115 inches and 145 inches.